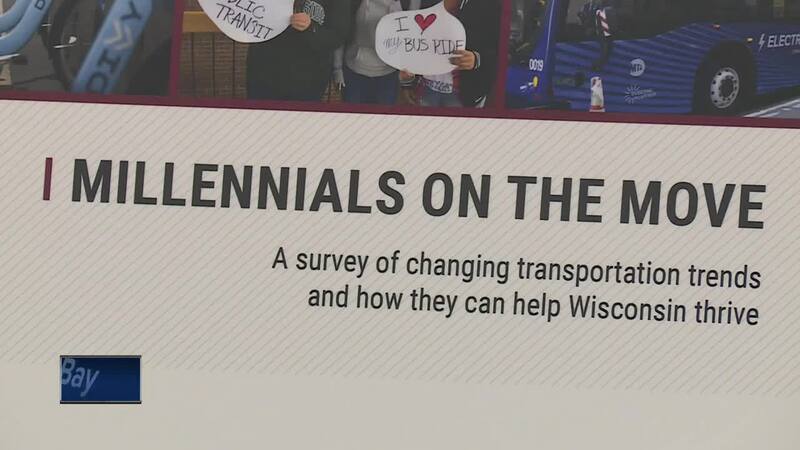 The WISPIRG foundation, an independent advocacy group for public interest, released a report, Millennials on the Move, showing that young adults in Wisconsin want alternatives to driving cars. The group held a press conference in Appleton Thursday discussing their hopes for public transit. Some millennials who spoke with NBC26 say there aren't enough transportation options here in northeast Wisconsin and they want more. Last year, WISPIRG surveyed more than 600 college students in Wisconsin and found over 75% said having transportation alternatives to cars was very or somewhat important to them. 75% said living in a place with non-driving transportation after college was also very or somewhat important to them. Some millennials who spoke with NBC26 say cars are expensive and a hassle to maintain, requiring money and time they don't have. They want the state to invest in improving other transportation options like public transit, walking and biking. "In order for us to experience the best quality life, we have to have these amenities that allow us to do so,” said Aniya Spears, a freshman at Lawrence University. Overall, students say they want to be able to get to wherever they want, whenever they want. More than half of those surveyed say they would be somewhat or much more likely to stay in Wisconsin after graduating if they could go about their daily activities without a car. Some millennials say in the past, owning a car was the American Dream, but now they dream of a world where owning a car isn't necessary. APPLETON, Wis. — The WISPIRG foundation, an independent advocacy group for public interest, released a report, Millennials on the Move , showing that young adults in Wisconsin want alternatives to driving cars. The group held a press conference in Appleton Thursday discussing their hopes for public transit. Some millennials who spoke with NBC26 say there aren't enough transportation options here in northeast Wisconsin and they want more. Last year, WISPIRG surveyed more than 600 college students in Wisconsin and found over 75% said having transportation alternatives to cars was "very" or "somewhat" important to them. 75% said living in a place with non-driving transportation after college was also "very" or "somewhat" important to them. Some millennials who spoke with NBC26 say cars are expensive and a hassle to maintain, requiring money and time they don't have. They want the state to invest in improving other transportation options like public transit, walking and biking. "In order for us to experience the best quality life, we have to have these amenities that allow us to do so,” said Aniya Spears, a freshman at Lawrence University. Overall, students say they want to be able to get to wherever they want, whenever they want. More than half of those surveyed say they would be "somewhat" or "much more likely" to stay in Wisconsin after graduating if they could go about their daily activities without a car. Some millennials say in the past, owning a car was the American Dream, but now they dream of a world where owning a car isn't necessary.